Summary : Being born a princess, and raised by a loving father and three doting brothers would make life seem like a bed of roses to any woman. 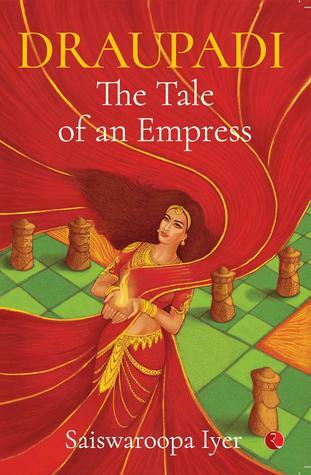 Born out of the sacred fire, Draupadi is no ordinary woman, and her destiny cannot be to walk the beaten path. Witnessing estrangement and betrayal within her own family makes her perceptive and intuitive beyond her years. Complicated marital relationships, a meteoric rise and a fateful loss, humiliation unheard of and a pledge of revenge, all culminating in a bloody war—her ordeal seemed never-ending. Yet she stands up to it all—never succumbing, never breaking. One of the most unforgettable characters of the Mahabharata, Draupadi shows what a woman is capable of. Told with great sensitivity and passion, this book brings alive a character of epic proportions that resonates with every reader across space and time. There’s always room for awesome thriller writers in the Indian market because as a thriller lover, I’m always looking for a intl standard thriller and I’m usually disappointed. Till now. You know the other day I did ten pushups and felt very proud of myself. Then I read Anywhere But Home. For those that don’t know Anu Vaidhyanathan she is the first Asian woman to have competed in Ultraman Canada. To be honest I hadn’t even heard of Ultraman and if I had I’d have thought it was a deodorant company. But I googled it and immediately became an admirer of Miss. Vaidhyanathan. The ultraman is a very taxing endurance test of sorts. It involves a 10 KM swim, 425.6 KM bike course and an 84.4 KM run. I can’t even do a 100 metre swim so you can paint me sufficiently impressed. I heard about Anu Vaidhynathan first on twitter when people were talking about the Coimbatore race. I clicked on her profile and started learning about this impressive woman who is from a traditional Tamil Brahmin family. A while later I was given an opportunity to read and review Anywhere But Home and since the book was already in my amazon wishlist, I typed out YES in a frenzy and sat waiting. I wanted to know all about her, what made her who she is, how she went from a studious sports hating person in a curd rice eating body to someone who wanted to drop everything to go for a run on muscular limbs. Like a lot of talented people, Lucia Berlin is someone who wasn’t celebrated during her time. Atleast not the way she deserved. In A Manual For Cleaning Women she displays a wit and observation of people that is rare to find. It strikes me as particularly unique because most of these things are things that I’ve started wondering now that I’ve read this collection. CURRENTLY NOT ACCEPTING REVIEW REQUESTS. Please check my review policy before emailing me. Thanks. In case you didn’t know, I’m an illustrator as well. You can checkout my Gumroad and Redbubble stores below.